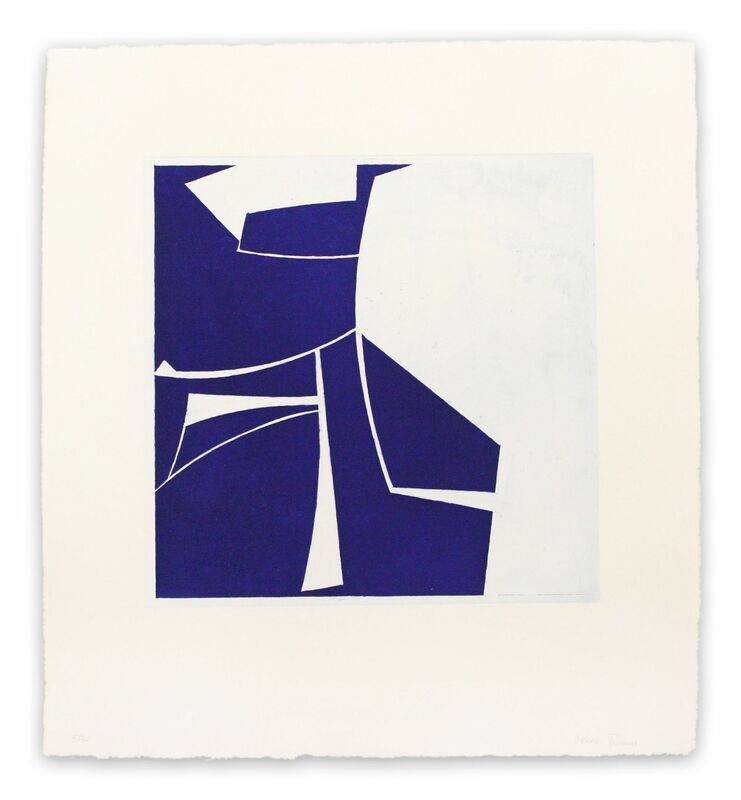 Joanne Freeman is an American abstract painter who creates minimalist reductive paintings and works on paper, featuring hard edged abstract forms and bold, vivid, gestural markings. She lives and works in New York City. Freeman attended the University of Wisconsin, where she earned a B.S. in Fine Arts in 1976. She earned her M.A. in Studio Art from New York University in 1981. She has taught painting and drawing at NYU and The New School for Social Research and worked as a visiting artist and lecturer at The New York Studio School and the Massachusetts College of Art. The American artist paints with gouache on Khadi, a handmade Indian paper fashioned from long fibered cotton. Her oeuvre is exemplified by vivid colors, geometric shapes, hard edge lines, and curved, gestural marks painted against white backgrounds. Freeman presents a reductive visual language that references urban symbols and signs, architectural patterns, and the interplay between shadow and light. Freeman's process involves taping off areas to create hard edges, and combining those areas of control with spontaneous mark making. The scale of her works and the marks she creates are both dictated by the extent of her physical reach. The resulting images express physicality, emotion, limitation and randomness, combined with a precise, minimalist aesthetic. Freeman is heavily influenced by the ideas of the Bauhaus School, which emphasized combining the ideas and techniques of art, architecture and design. She endeavors to present new forms in a simple way. The artist also influenced by Mid-Century modern graphic design aesthetics. The hard edge look of many of her images references well-defined shadows created by sunlight on buildings. She's an admirer of the work of reductive artists such as Ellsworth Kelly, Paul Feeley, and Kenneth Noland. Her striking pieces are included in numerous corporate collections, including those of The Prudential, Readers Digest, and the University of Maine Museum of Art, and private collections including those of Gail Stavitsky, the Curator of Collections and Exhibitions for the Montclair Art Museum, and Andy Summers, guitarist for the band The Police. Freeman has exhibited her amazing paintings extensively in galleries and museums, in solo and group exhibitions, throughout the US and internationally. The artist's solo show entitled Recent Paintings and Drawings was on display at Kathryn Markel Fine Arts, NY, in February 2016. Her art has been reviewed in ARTnews and The New York Observer. Kathryn Markel Fine Arts, My Generation, NY. NY. Kathryn Markel Fine Arts , NY. NY. University of Maine Museum of Art, Bangor M e.
Lohin Geduld Gallery NY. NY. Repetition & Change , Joanne Freeman, Gerri Rachins, Brant Gallery, Mass.College of Art , Boston , Mass. Bess Cutler Gallery, Santa Monica, California. Bess Cutler Gallery, NY. NY. The Queens Museum, Flushing, NY. Just Above Midtown/Downtown, NY. NY. Art on Paper, Kathryn Markel Fine Arts, Pier 36, NY. NY. International Fine Print Dealers Association, NY. NY. Just Under 100, New Prints Summer 2017 International Print Center, NY. 50 Shades of Red, Herter Gallery, University of Massachusetts , Amherst , Mass. Formal Aspects, Visual Dialogue in Structure , Cape Cod Museum of Art, Dennis , Mass. A few Conversations About Color, dm c ontemporary NYC , NY. Paperazzi, Janet Kurnatowski Gallery , Brooklyn, NY. Sideshow Nation, Sideshow Gallery , Brooklyn, NY. Familiar LIne , Key Projects, Queens , NY. Color, Shape and Form, Galerie Gris, Hudson NY. Maine, Bogart Salon, Bushwick, NY. Instructors Show , The School House Gallery, Provincetown, Mass. Paper , Janet Kurnatowski Gallery, Brooklyn, NY. Drawing Atlas, Pennsylvania College of Art and Design, Lancaster, PA . Drawing Atlas , Lohin Geduld Gallery, NY. NY. Masur Museum of Art, Munro La. Selections, Lohin Geduld Gallery NY. NY. Summer Group Show, Lohin Geduld Gallery, NY. NY. Neo Plastic Redux, Elizabeth Harris Gallery, NY. NY. Contemporary Art Month, San Antonio TX. Mod , Broadway Gallery, NY. NY. History Lessons, Aramona Studio, NY. NY. One on One , Massachusetts College of Art, Boston, Mass. Persistence of Painting, Varieties of Vision , Kohn Pederson, Fox Gallery, NY. NY. Auction for Action Act Up New York , Paula Cooper Gallery, NY. NY. Benefit Auction , The New Museum of Contemporary Art, NY. NY. Gallery Artists, Bess Cutler Gallery, NY. NY. Gold Show , Minor Injury, Brooklyn, NY. Nite Show , Public Image Gallery, NY. Update 84 - 85 , White Columns, NY. NY. Art Against Apartheid , ABC No Rio, NY. NY. Christminster Fine Art, NY. NY. Hot, Gracie Mansion Gallery, NY. NY.